Writing this book was a journey into uncharted territory. 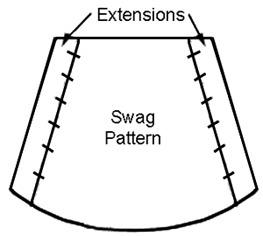 Learning and defining the engineering concepts of swag patterns has never truly been attempted before. As such, I am still learning new things every time I fabricate a swag. The purpose of this page is to expand on the information found in the book, as well as clarify any points which were confusing or ambiguous. I would also hope that you would contact me about any information in the book which was either confusing or new and interesting for you. I will be happy to discuss any questions you might have. Cutout swag - pattern length. Instructions on page 6.5 for calculating the pattern length are incomplete and confusing. Point-to-point swag - pattern length. Instructions on page 7.5 for calculating the pattern length are incomplete and confusing. Eliminating raw edges at the back of the pleats. The raw edges of the pleats on the backs of the swags were a concern. These instructions show you how to eliminate them. Fullness. How the width of the pleat allowance affects the look of fullness. Bottom Curve and Rise. Why it is better to always drape a weight chain to determine the bottom curve length. Sagging lining. Often a vexing problem. Cut on the bias or straight? Pictures showing the difference on striped swags. It was pointed out to me that the names given the swags in my book do not follow the WCAA standards as published in 2001. I did not have a copy of the standards at the time I was writing. I knew they existed, though, and thought long and hard about what names to give the swags described in the book. I chose the names to describe the specific characteristics which make each of the three styles unique. This board mount swag has a very small picture area. WCAA names this the Queen Anne Swag. This board mount swag has a picture area that is about 1/2 the finished width of the swag. It is a nice balance of folds and picture. WCAA names this the European Swag. Finally, this board mount swag has a very wide picture area with the pleats stacked on narrow pleat allowances. The WCAA names this a Stacked Swag. Cutout Swag. This is most commonly known as the Pole Swag and is named that in the WCAA standards. The reason I did not specifically call it the pole swag in the book, though, is because it may be hung on the face of a cornice board or on individual boards under the pleat allowances to give the impression of 'floating swags.' In naming these Cutout Swags, I hoped to evoke a mental picture of a Basic Board mount Swag which retains its pleat allowances, but has the center picture area 'cut out'. Point-to-Point Swag. If you think typing that name over and over is easy, think again. 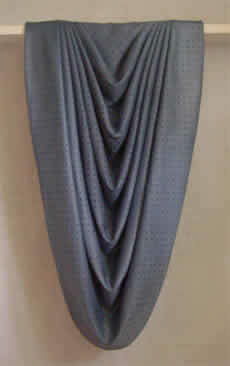 It is also known as a Drapery or Necklace swag because it is often paired with a drapery panel. WCAA Standards have labeled it a Drapery Swag. Once again, though, its use is more diverse than that. It can be hung with other similar swags and no draperies. Its general shape is the basis for the scarf swag. The Point-to-Point name is meant to evoke a mental picture of a swag with no pleat allowances which is suspended from two ends. The most basic reason for my naming conventions is to help you look at a picture of a swag and be able to define which swag style it is so that you can effectively draw the best pattern. If it has a picture, it is a Board Mount Swag. If it does not have a picture, but has pleat allowances, it is a Cutout Swag. If it has no picture and no pleat allowances, it is a Point-to-Point swag. Clarifying the type of pattern this book will teach you to draw. I don't think I clarified in this book that everything in the book applies to swags which are hung on a straight line. They do not apply to swags with one side mounted higher than the other. Volume 2 addresses the inherent differences in designing and drawing those patterns. Also, this book does not teach you how to cut the 'fingers' into the swag sides (the familiar 'Christmas tree' swag pattern shape) which many swag patterns have. When working with a custom swag, you need to have as much flexibility to pleat and troubleshoot it as possible. Once fingers are cut into the sides, the swag loses its flexibility and must be pleated following the fingers. However, you will find below instructions on how to draw a pattern in the Christmas tree shape. The length of the pattern gives the swag its fullness. An acceptable default is to draw the pattern at 2x full. For cutout swags, the pattern length should be based on the body of the swag itself. Body = Finished length minus cutout. If a cutout swag is to be 18" long with a 6" cutout, the body of the swag will be 12" (18 - 6 = 12). When calculating the pattern length, multiply the body of the swag by the desired fullness. If the same cutout swag is to be 2x full, the pattern length will be 26" ( ( 12 * 2 ) + 4 ). The length of the pattern gives the swag its fullness. An acceptable default is to draw the pattern at 2x full. For point-to-point swags, the pattern length should be based on the body of the swag itself. Body = Finished length minus cutout. If a point-to-point swag is to be 18" long with a 6" cutout, the body of the swag will be 12" (18 - 6 = 12). When calculating the pattern length, multiply the body of the swag by the desired fullness. If the same point-to-point swag is to be 2x full, the pattern length will be 26" ((12 * 2 )+ 4 ). Under step 2, the first pleat, I indicate that wider swags may need a first pleat of 1.5 - 2" to give the first fold some depth. This is incorrect. I have learned since that it is actually the opposite. The wider a cutout swag at the top, the less you have to put in the first pleat. A six foot wide swag I patterned recently had no first pleat. The top corners of each side were secured flat. The top line of the swag draped into a nice fold automatically. Also, a typographical error shows step 4 missing. It is not missing, the steps are simply misnumbered. A concern from the first volume on swags was the raw edges of the pleats that showed at the back of most swags. Yet, the swags were admired for their lack of bulk at the board line. Ideally, a quality custom swag should not have exposed raw edges of fabric. This is accomplished by cutting the pattern in a Christmas tree shape with jagged sides, but at the cost of adding bulk on top of the board. 1. Draw the pattern as you normally do, but do not cut it out. This is the basic swag pattern. 2. Next, add an extension to the sides that acts as a 'board allowance' for the pattern. Extend the top line and bottom curve 3-4. Draw a line connecting the top and bottom. When in doubt, make the extension 2-3 larger than you think you need. The excess is simply cut away after pleating. 3. Cut the pattern, open and lay flat on the table. Draw the pattern side on the other half. Mark the pattern sides for pleats. 4. Pleat the pattern. Smooth the layers of fabric out of the way and pin the point of each pleat at the board allowance. Troubleshoot the pattern. 5. Unpin the pattern and use it to cut the actual swag with straight sides. After sewing and pressing the swag, draw the basic swag pattern on the face and mark the pleats with with chalk or disappearing ink. Pleat the swag the same way you pleated the pattern, smoothing the excess fabric up and out of the way and aligning the pleat points with the board allowance. Troubleshoot for minor imperfections. By leaving the sides straight, you have the extra step of drawing the pattern shape and managing the extra fabric on every swag in the treatment. But you also have the flexibility of troubleshooting and/or further customizing the swag if desired. 6. Draw a straight line along the board allowance. While still pleated on the board, cut the excess fabric away along this line. When unpinned, the pattern has the jagged edges of predefined pleats (the familiar "Christmas Tree" shape). Once cut, there is little flexibility for trouble-shooting the finished swag. It is best to cut away the predefined pleats in the finished swag instead of the pattern because the thickness of the layered fabrics in a finished swag alters the dynamics of the pleats. If there are multiple swags of the same size in the treatment, use the first swag as a pattern to cut the predefined pleats in the other swags. 7. Follow standard procedures to finish the swag. The above swag is wide and short. It is 2x full. The swag to the right is long and narrow and 1.5x full. Both are cut on the straight of grain. It seems that how far apart the pleats are spread in the pleat allowance contributes to how full the swag looks and how well it hangs. In the photo above, even though this swag is 2x full, it looks less full than the one on the right. This is because its pleats are spread wide to cover a wide portion of the board. If you are designing a swag which is wide and short and your pleat allowance is going to require each pleat to cover 2-3" or more of space, you would do well to plan 2-3x fullness. Always plan more than you think you may need. It is easier to cut it away than to add it back on. In the photo to the left, even though this swag is only 1.5x full, it looks like more. This is because the pleats are stacked heavily on each other and the folds are close to each other. When planning a swag which is very long in relation to the finished width, plan 2x fullness or less. In the book, I provide a chart for calculating the bottom curve of the pattern based on the finished length and width of the swag. The calculation for this chart is the Catenary Curve formula, an established mathematical formula. This formula, when applied to the finished width and length of a shade gives an answer that is slightly too big for an actual swag pattern. This inaccuracy compounds for larger swags. Each swag has a very specific finished width and length, which results in a very specific bottom curve length. When the pattern is drawn with the proper rise and bottom curve length, a perfectly balanced swag is the result. What we have found is that, using the catenary formula for drawing the bottom curve length causes you to draw a bottom curve which is slightly longer than required. The swag does not pleat into a properly balanced swag. Therefore, the bottom curve length chart in the book is very handy for calculating trim requirements and fabric requirements. When drawing the pattern, though, it is best to use the weight chain method to simulate the finished width and finished length and measure that weight chain for an accurate bottom curve length. The resulting swag has the exact finished dimensions. Extra Large Swags. Special considerations. Weight chain stretches. If, when draping chain to simulate curves of the finished swag you feel the chain is being stretched, switch to a heavy ribbon or cording that will drape but not stretch. I have found that, when the weight chain stretches while hanging, it relaxes when measured. This results in a bottom curve that is too small and a finished length that is too short. If the swag is very wide and short - an inverted eyebrow shape, the pleat allowances will be spread over a wide area. Build extra fullness into the pattern length. It can be removed if the swag is too full. A wide swag, like long panels, needs extra fabric in each fold to hold its shape over the width of the swag. Also, the wide pleat allowances need fullness in the swag in order to have the fabric to pleat. Understitching. After sewing the bottom curve seam, open the layers and lay flat on the machine table, right side down. Smooth the seam allowance over to lay on the lining. Topstitch 1/4" away from the seam through the seam allowance and lining. You can opt to lay this wrong side down on the table with the seam allowance smoothed under the lining and topstitch from the right side of the lining. This attaches the seam allowance to the lining. It is a proven dressmaker trick and does seem to help control the sagging lining. Understitching is a very effective technique for many applications on window treatments. Hand tacking. Depending on the texture of the face fabric, you might be able to tack the lining to the face by hand from the lining side. Use large stitches, burying the thread between the fabric layers and catching only a thread or two of the face fabric with each stitch. Trim. Topstitch a decorative trim or braid to the bottom curve of the swag. The stitching will help keep the lining intact. Cut on the bias or straight? Workrooms are often given striped fabric from which to fabricate swags. The first question is always, do I cut this on the bias or the straight of grain. For your information, the following two pictures are striped swags, one cut on the bias and one cut on the straight of grain. This swag was cut on the straight of grain. The stripes tilt inwards from both sides creating symmetry. It also does not want to drape quite as softly. This is compensated by bringing the kink in each fold to the center of the swag. This swag was cut on the bias. The stripes on one side tilt inwards. The stripes on the other run straight up and down. This is a feature of a bias cut stripe. It is an acceptable look and, with planning, could be set up in an asymmetrical treatment of two windows.